In an earlier post, I mentioned the haunting music of Norwegian vocalist Unni Løvlid, and the request of SweetKali and timing of the upcoming World Sacred Music Festival here in Olympia are reason enough to revisit her voice. 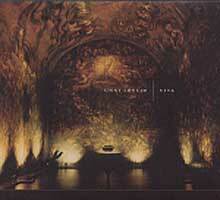 Løvlid, who is also the vocalist in the Norwegian trio Rusk, recorded this album in what a less accomplished singer would consider a most intimidating atmosphere: singing solo, in front of an audience, in a tomb. The album is named after the fresco artwork that covers the Tomba Emmanuelle, which explores the theme of "eroticism and man's sexual instinct, conveyed through multitudes of naked bodies, women and men in impetuous intimacy." The resonant atmosphere is stunning, even through the filter of the CD. "O At Skue" is a song sung by Løvlid's great-trandfather Samuel. She never met him, but recalls in the album's liner notes that "in 1994, my grandmother gave me a cassette recording of her father singing. Looking at me she said: 'I don't want to tell you everything, for you to remember.'" [mp3] Unni Lovlid: "O At Skue"
SoundRoots likely will feature more sacred world music this week. Would love to hear about your favorite sacred musical traditions or artists.